So What's In a Name? | Happy Up Inc.
Quite a lot - history, memories, and a way to tidily sum up what something is. For a business, the name is hugely important. We have been Once Upon a Toy and LagoonaMagoo Toys. This year has brought us upheaval, stress, heartbreak, hopefulness, joy, and overwhelming thankfulness. We’ve been forced to take a long careful look at our entire business. To make it, to succeed, to keep our heads above water and maybe even thrive, we need to eliminate the things that hurt us and put in place things that will help. We have discovered that our store names are stumbling blocks. Once Upon a Toy is a beloved destination for long-time Edwardsville residents. The name doesn’t resonate in the rest of the world. We are often confused with the children’s resale chain Once Upon a Child. As we meet new people in the Edwardsville/Glen Carbon area, as well as in St. Louis, we are constantly needing to explain that “no, we don’t sell used stuff, you’re thinking of a different store”. We’re sure this has hurt us for many years. LagoonaMagoo Toys is fun to say and fun to type. Unfortunately, it is constantly misspelled and mispronounced. We spend a lot of time correcting this. A lot of our customers find us because of word of mouth. If they don’t have the name right, we’re losing potential new friends! With two store names and an umbrella corporate name, our marketing efforts haven’t been as effective as they should be. With three logos and three names, the water is muddy. By gathering everything under one name, we can have clarity and focus. One name, one logo, one message. We stock so much more than just toys and games for kids. We carry products that appeal to grown-ups, too. And we need a name that reflects the huge range of items on our shelves. It’s not just toys - it’s gadgets and fiddly things and funny stuff and so much more. We’re lightning in a bottle. We’re crazy and clever and more than just “toys”. We need a name that will let us move forward without the issues we’ve been trying to work with and and gloss over. We need a fix, not a band-aid. Our customers and friends helped save us. Now we have to take this opportunity and make sure we correct the things that aren’t working. We are ready to embrace the future. 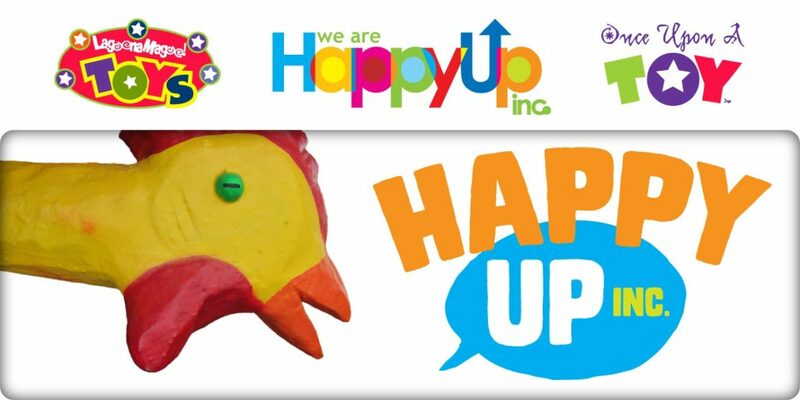 Now, we truly are, Happy Up Inc.